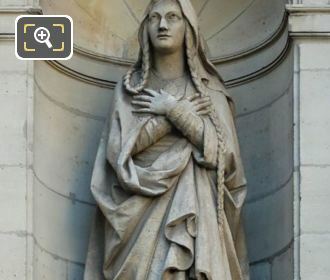 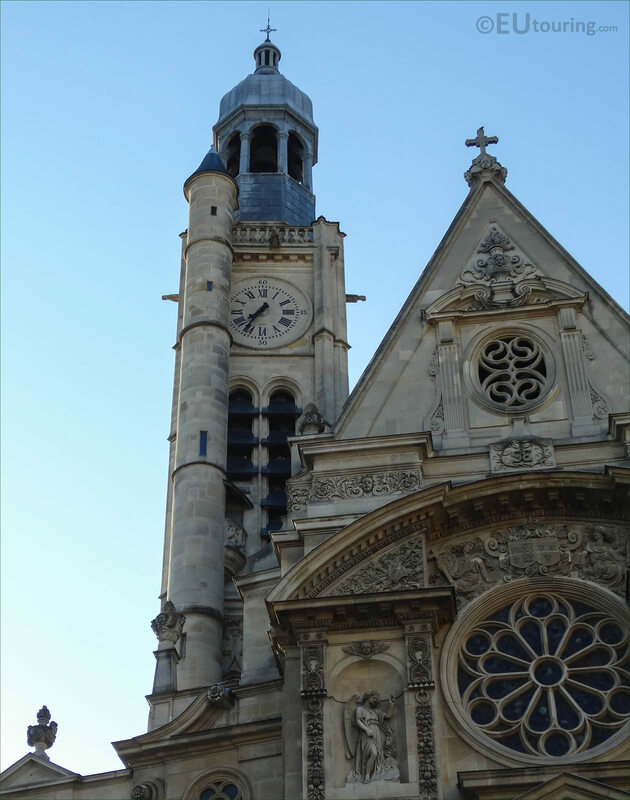 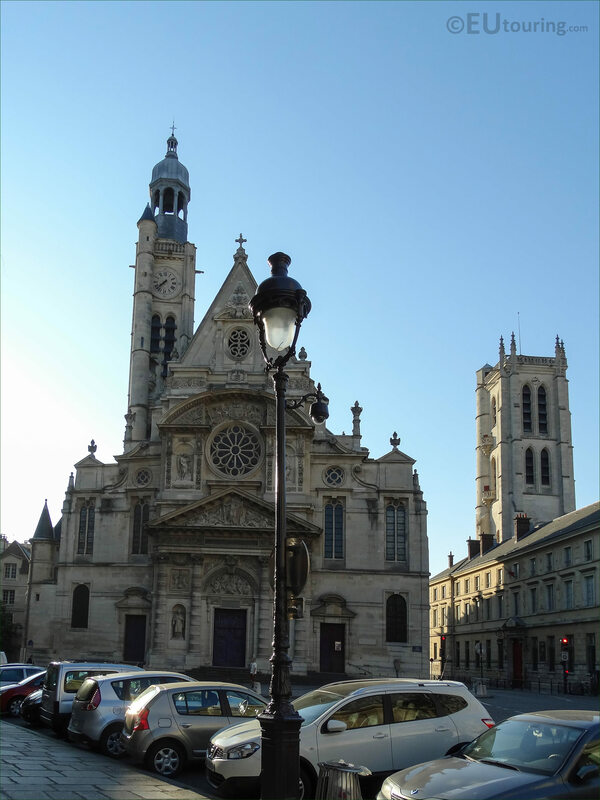 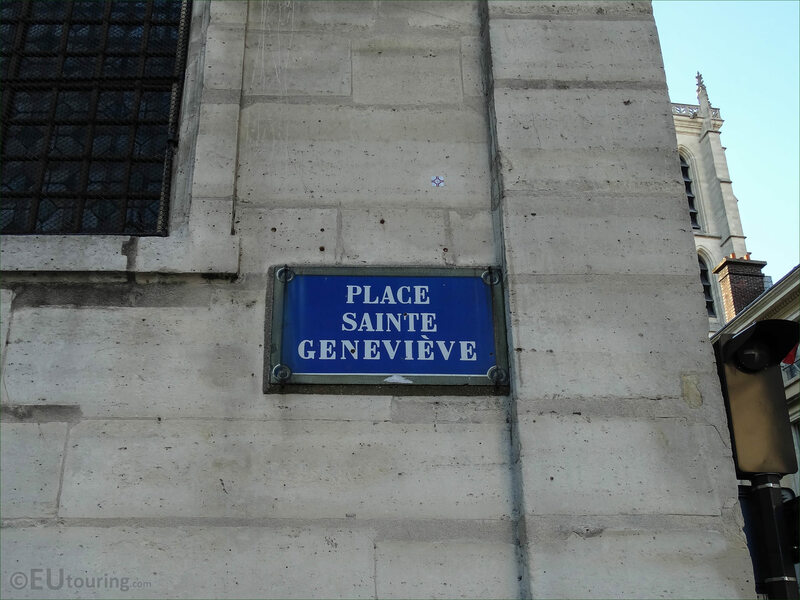 We were in the 5th Arrondissement of Paris at the Place Sainte Genevieve, when we took these high definition photos showing the Eglise Saint-Etienne-du-Mont. 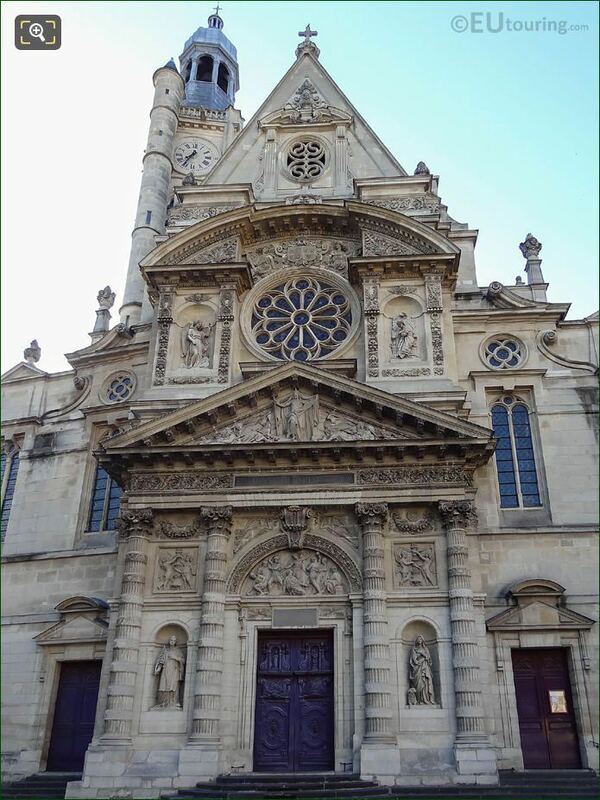 The church was started in a Gothic style, however some parts of this are also in a Renaissance style, but as with many churches in Paris, much of the decoration on the facade was destroyed during the French Revolution and was subsequently restored in the 1800s to its former glory, by the architect Victor Baltard. 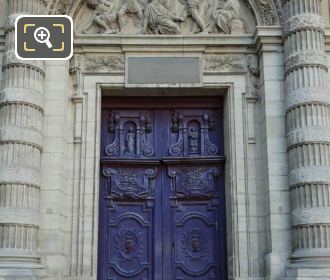 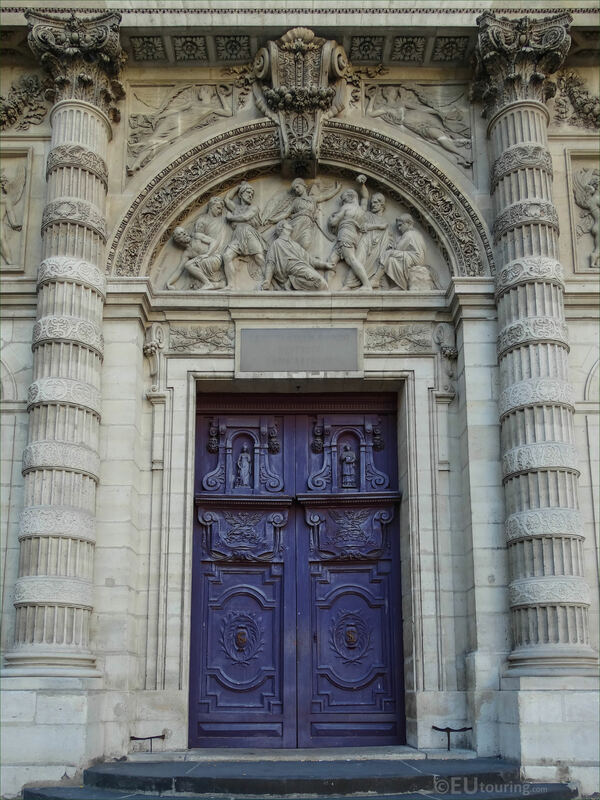 So here you can see the two ornate doors on the main facade of the Eglise Saint-Etienne-du-Mont with the tympanum sculpture above depicting a religious scene of Saint Stephen, which was restored by Gabriel Jules Thomas in the 1800s, and in fact, Saint Etienne is actually known as Saint Stephen in English. 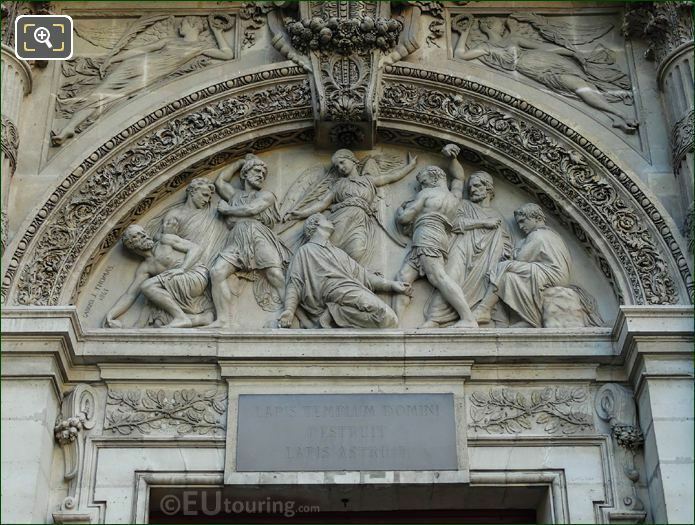 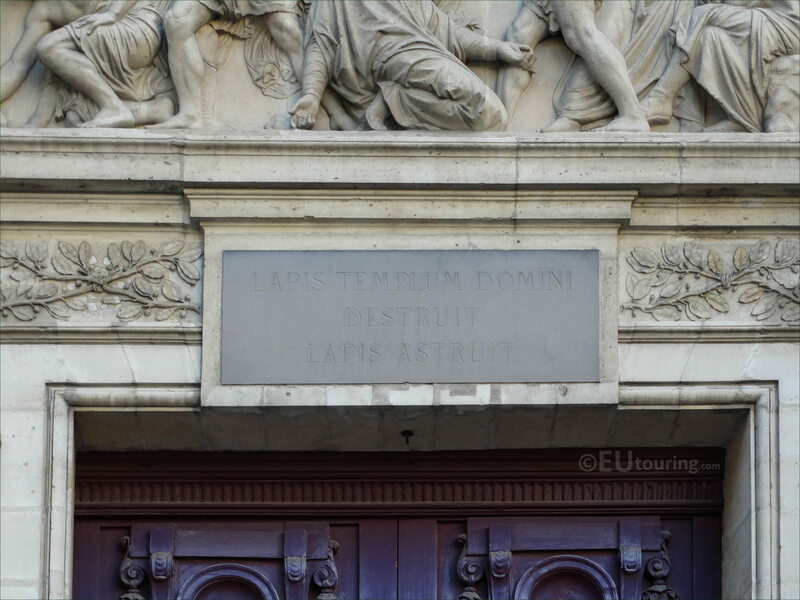 And this shows a close up of the tympanum, which is an architectural term often used for this type of decorative element located above the doors of a church, and this particular religious scene depicts Saint Stephen being stoned, and he is referred to as the first martyr. 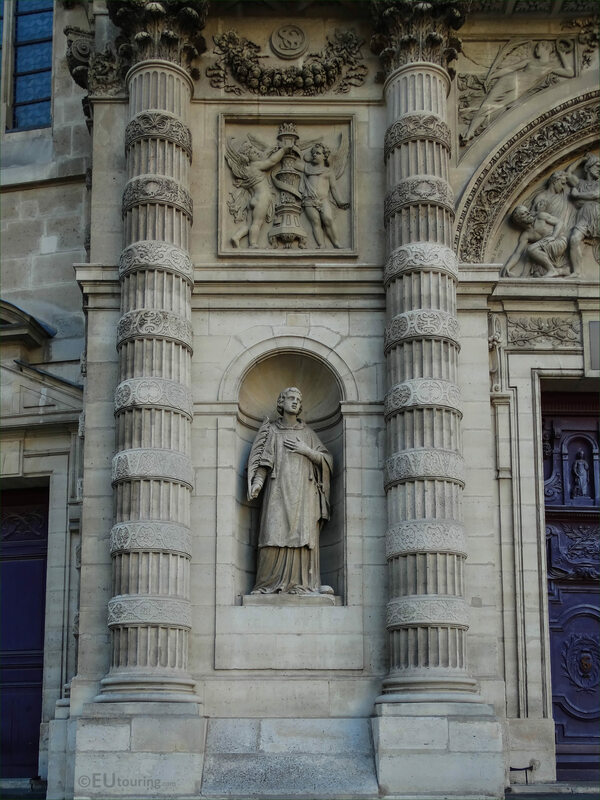 Stone Temple, Destroys, He added stone. 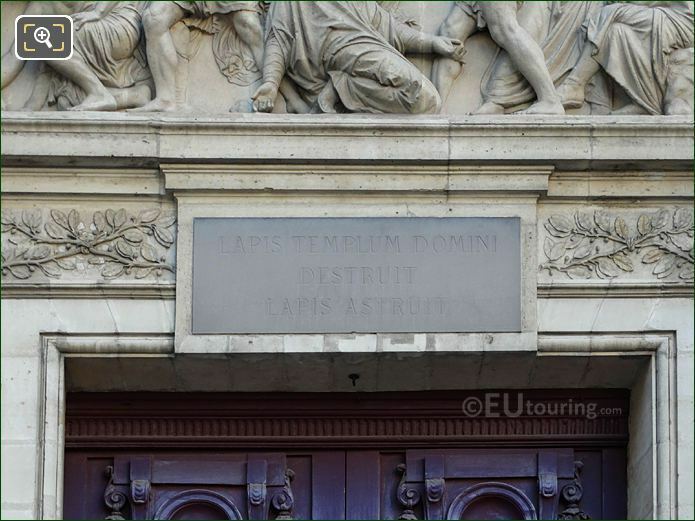 Or this last line could be Stone affirmed. 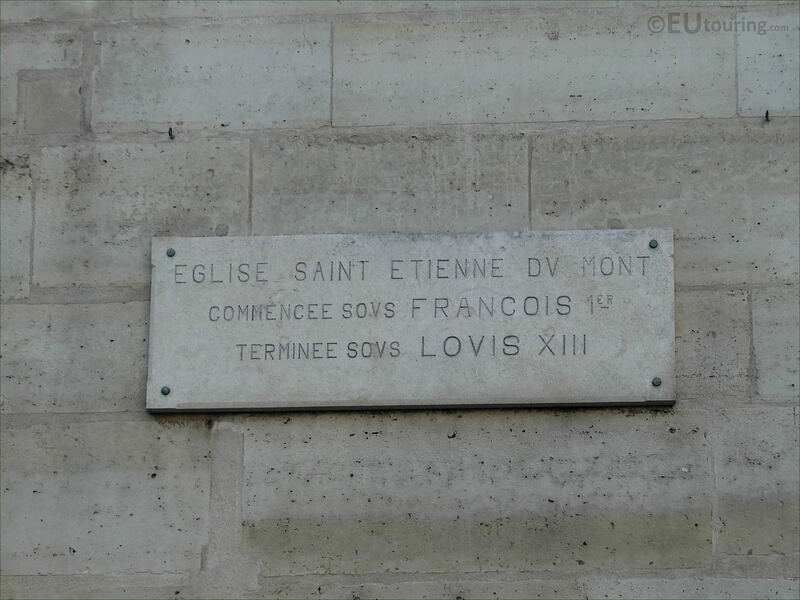 As you will see later on, many people class the Eglise Saint-etienne-du-Mont as being located at the Place du Pantheon, which is where we were standing when we took this photo, however, the church itself is in a small area called the Place Sainte Genevieve, named after the former abbey where the saint was originally buried, and a shrine dedicated to Saint Genevieve is located inside this historical edifice. 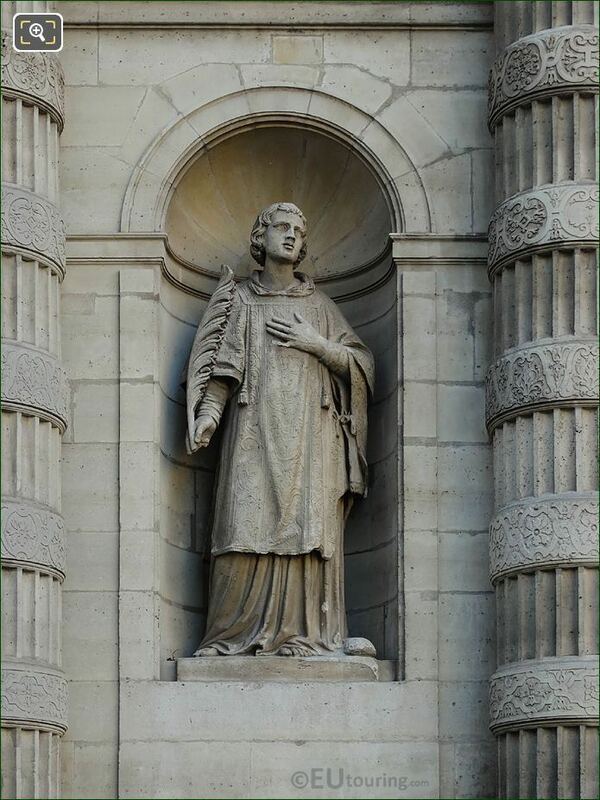 Located on either side of the main entrance doors there is a statue positioned within a niche, and to the left hand side, the statue depicts Saint Etienne, or in English Saint Stephen, who was originally the patron saint of the first cathedral in Paris, and the Eglise Saint-Etienne-du-Mont was dedicated to Saint Stephen. Although here is a close up of this statue, which was sculpted in the 1800s by Joseph Marius Ramus after the original had been destroyed during the French Revolution, and in art many times martyrs are depicted holding a palm frond, plus in Christianity each saint has an attribute and you can see by the feet of Saint Stephen is a stone,, which is how this martyr is often realised in paintings and sculptures. 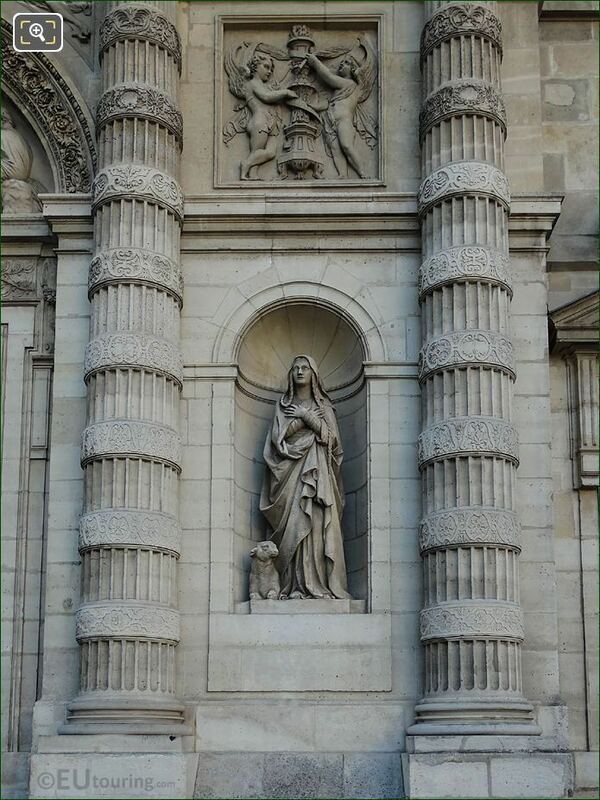 However, the above image shows a statue located within a niche to the right hand side of the entrance doors of the Eglise Saint-Etienne-du-Mont, and having to be completely redone in the 1800s after the original was destroyed during the French Revolution, this was produced by Victor Baltard. 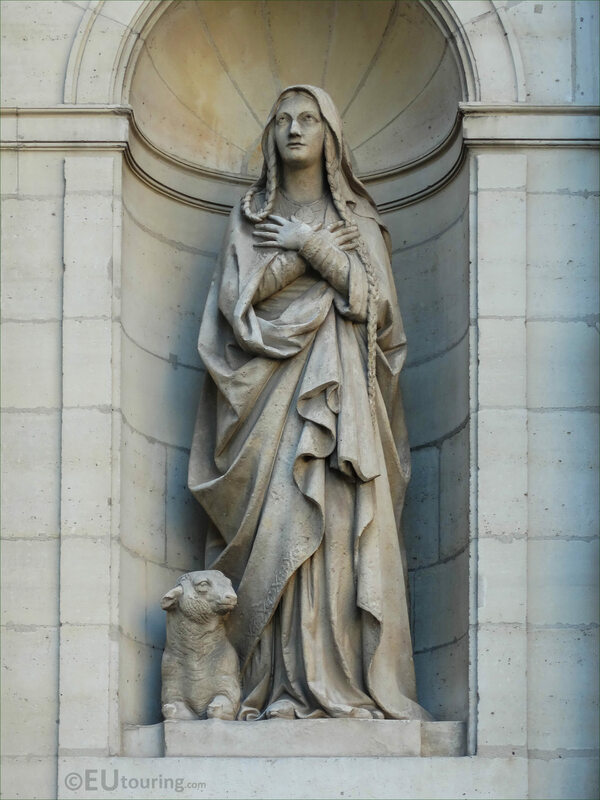 In fact, it was the architect Victor Baltard that was entrusted with the restoration of this historical church, and it was he who sculpted this statue of Saint Genevieve, who was originally a peasant girl, but became renowned for stopping the attack of Atilla and the Huns, hence becoming the patron saint of Paris, and the remains of her relics are now held within a chapel and shrine in this church. The tower and bell tower of the Eglise Saint-Etienne-du-Mont were actually started in the 1400s with the bells themselves cast in the year 1500, which was before the main facade was even started, although the entire project took decades to complete due to the Wars of Religion and turmoil caused in this period of French history. 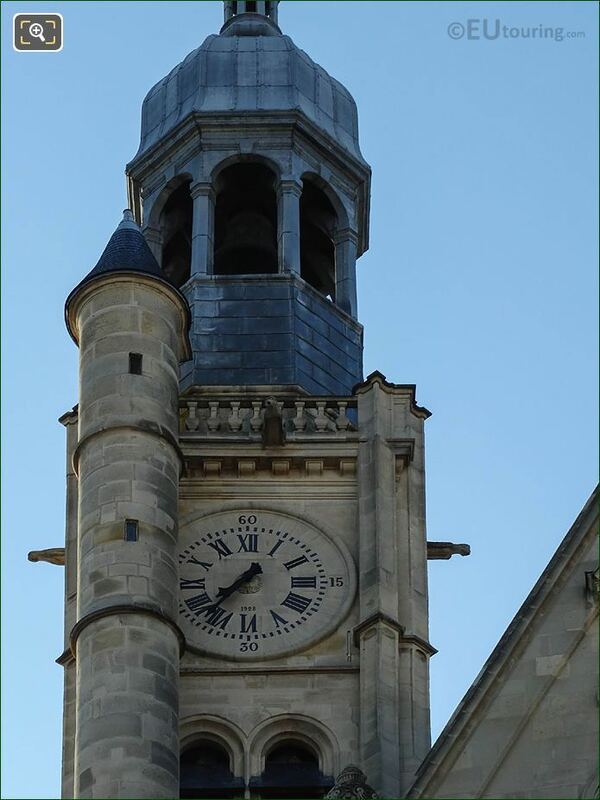 But this close up image shows a part of a medieval looking bell tower and two of the traditional Gargoyles positioned either side, that are a common feature on churches for dispersing water away from the outside architecture and its foundations, yet you will probably notice above the number 6 Roman numeral that the clock itself is a far more recent addition and this particular one only dates from 1928. 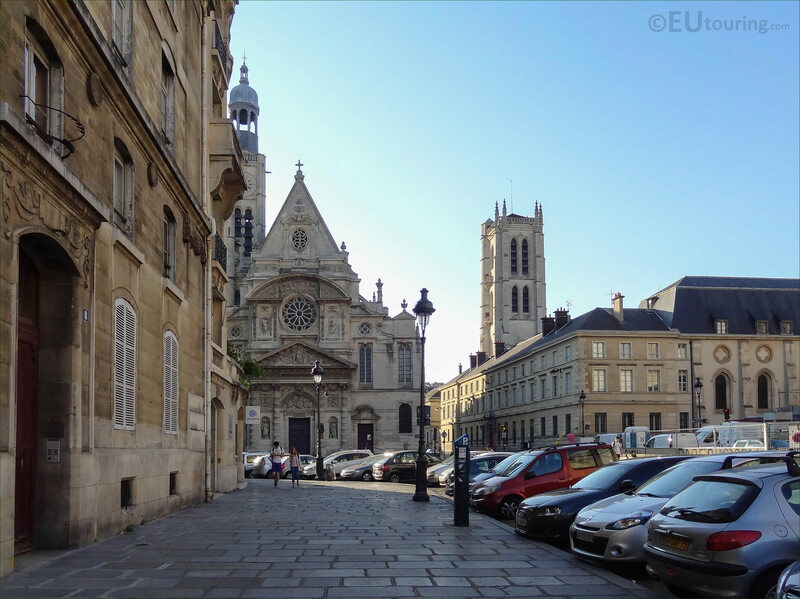 Whereas this is a view from the Place du Pantheon where we were standing, looking towards the Eglise Saint-Etienne-du-Mont and to the right hand side of this is the Rue Clovis that was created when the remainder of the former Abbey Saint Genevieve was destroyed, with the building you can see being turned into a school, yet just out of view to the right of the image would be the famous tourist attraction of The Pantheon. Located on the front facade to the right hand side of the Eglise Saint-Etienne-du-Mont, you will see one of the signs stating the Place Sainte Genevieve, which is where this church is located, however, some also refer to this as being at the Place du Pantheon, due to its proximity with the famous monument of The Pantheon. 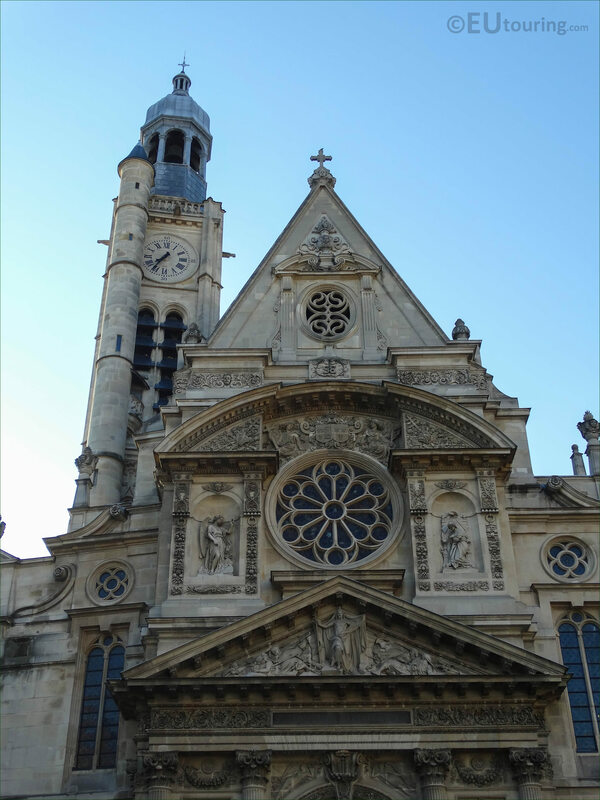 Eglise Saint Etienne du Mont commenced under Francois I and finished under Louis XIII. 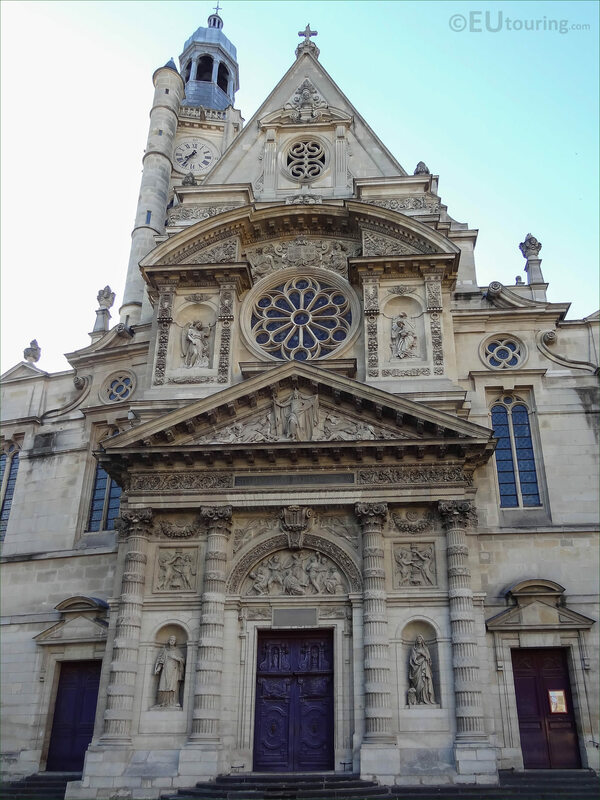 And these were the Kings of France reigning at these times during the history of the church construction. 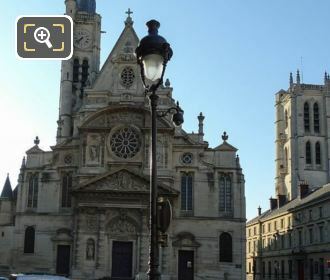 So here you can see the upper part of this historical centuries old church with the rose window above the tympanum and another ornate sculpture above this, and incredibly, this church has some of the most renowned sets of stained glass windows to be found anywhere in Paris, along with its mix of architectural styles from Gothic through to Renaissance. 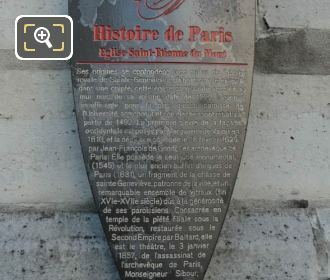 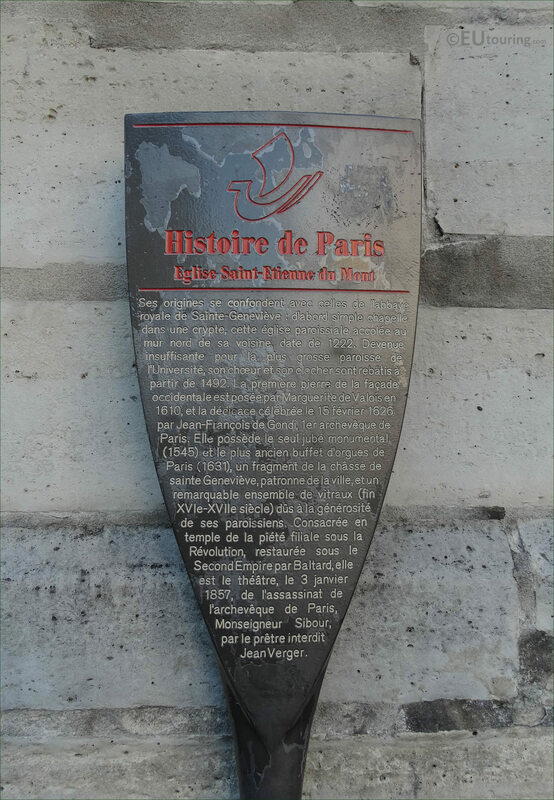 Yet this image shows one of the tourist information boards designed as a shield and always stating at the top Histoire de Paris, which in English translates to History of Paris, this particular shield provides a brief history of the Eglise-Saint-Etienne-du-Mont, from its origins through to its restoration. 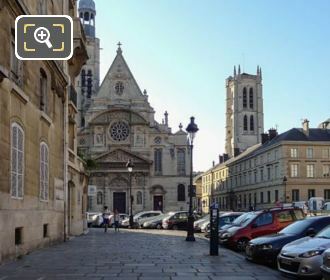 Therefore, if you are in the 5th Arrondissement of Paris, this a fascinating church to discover, both on the outside and the inside, which includes the shrine of Saint Genevieve and the oldest organ case in Paris dating from the early part of the 1600s, to name a couple of unique aspects, not forgetting this is a working church with services and mass, along with being a pilgrimage site.